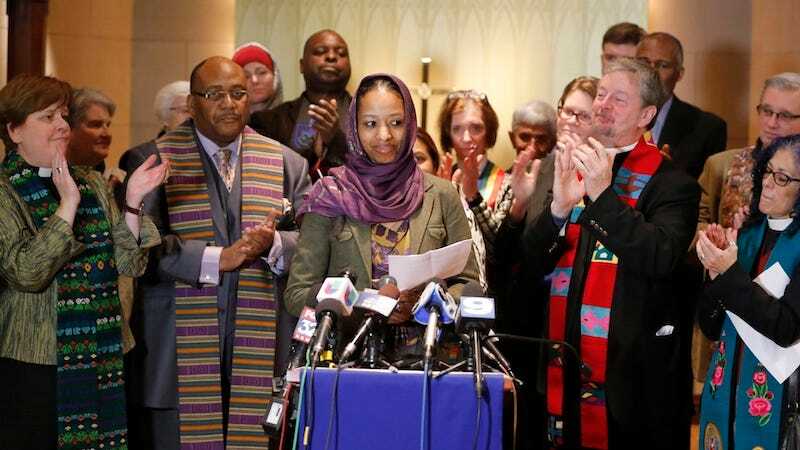 A Christian college in Illinois has begun the process of firing Dr. Larycia Hawkins, a political science professor who suggested in one of her classes that Christians and Muslims believe in the same god. According to a statement posted on Wheaton College’s website, on Monday, January 4, Provost Stanton Jones delivered to President Philip Ryken a “Notice of Recommendation to Initiate Termination-for-Cause Proceedings.” That action begins the institution’s “process for employment actions” for tenured faculty. Per the college’s guidelines, Hawkins will receive a hearing before the Faculty Personnel Committee and Ryken and Jones will make recommendations to the board of trustees. That board will make a final decision regarding Hawkins’ employment. Hawkins, who is Christian, began wearing a hijab in response to what she called “vitriolic” rhetoric against Muslims. “In the spirit of Advent, my actions were motivated by a desire to live out my faith, period,” she said at a December news conference, according to the AP. Hawkins has been asked to affirm the college’s statement of faith four times since she started teaching at Wheaton nearly nine years ago. She was first admonished for writing an academic paper about what Christians could learn from black liberation theology, which relates the Bible with the often-troubled history of race relations in America. Jones said Hawkins’ article seemed to endorse a kind of Marxism. She was called in a year later to defend a photograph someone posted on Facebook showing her at a party inside a home on Halsted Street the same day as Chicago’s Pride Parade. Last spring she was asked to affirm the statement again after suggesting that diversifying the college curriculum should include diplomatic vocabulary for conversations around sexuality. Last week, she faced questions a fourth time over her Facebook post that Muslims and Christians worship the same God. She said she was simply reiterating that there is common ground among the monotheistic Abrahamic faiths, which many theologians have said for centuries. Halfway across the country, a professor has been fired from Florida Atlantic University for writing that the Sandy Hook shooting was a hoax to influence the passage of gun control legislation. Professor James Tracy reportedly harassed parents who lost a child in the shooting demanding proof that they were not government agents and that they had rights to a photograph of the child.